I'm honored to have an article about the "Visiting Day" project in the most recent issue of Qualitative Research in Psychology. It's a special issue about creative representations of qualitative research. 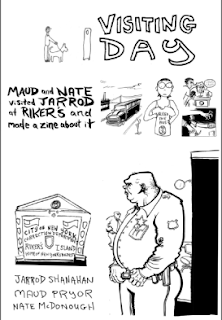 Rooted in my collaborative project with Nate and Maud, I trace the political history of the zine form, craft a Hegelian-Marxist theory of the zine as a social relation, and argue for the prison zine as form of autoethnographic inquiry long ignored by researchers. Pick up a copy of the zine here!